Just like regular Mail Designer 365 layout blocks, table blocks distinguish between raw text and images. 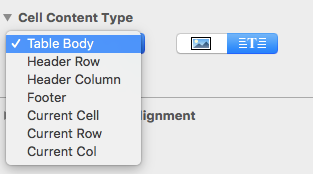 You can choose to make your table cells image blocks, text blocks, or a combination of both. Here you can change the content type of a cell by clicking on the respective icons. The text and image blocks work exactly the same in tables as they do with regular layout blocks.